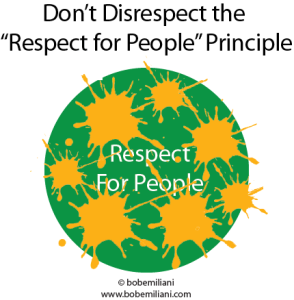 The “Respect for People” principle is not a toy to play with. It is not something to arbitrarily reconfigure to suit one’s narrow view of Lean leadership or a commercial interest. It must never be reduced to a tool, formula, or simple model. But, that’s what is now happening. Consultants and training organizations will create expensive “lead with respect” workshops and certifications to accelerate Lean leadership development. It will include classroom training, testing, and work projects, where success is narrowly defined to prove competency and to gain a new credential for the résumé. Soon, the credential will appear in job postings as a required qualification, as has long been the case for Lean tools certifications. This is wrong. Simplification of the “Respect for People” principle rejects the full mindset and scope of capabilities necessary to be a Lean leader. Despite this, a reductionist model for Lean leadership will be very attractive to busy leaders because it lessens the challenge and offers a much shorter path for one to claim success. In reality, actual leadership improvement will have been slight or could even deteriorate due to organizational politics. If learning is such an important part of Lean management, then those who create new a “Respect for People” model should have learned from those who despoiled the “Continuous Improvement” principle. They quickly made this principle to be nothing more than “tools for the manager’s toolkit,” resulting in the creation of Lean tool enterprises and Fake Lean on a grand scale. And kaizen, a critically important process for learning Lean leadership and what the “Respect for People” principle means, was reduced to an occasional “event” people other than senior managers to participate in. The “Respect for People” principle functions properly in the practice of progressive Lean management only when it is open-ended and loosely defined. The pioneers of progressive management preferred it to be that way. Why? Because it forced leaders to think, and to never stop thinking, because circumstances are always changing and understanding evolves over time. They knew from experience that thinking was a much needed capability that is always in short supply among leaders. It is a grievous error among the arrogant to assume they know better than the pioneering practitioners.